The ConferenceCam Connect is an impressive piece of hardware which fills a niche very nicely, although it's not without niggles, and doesn't come cheap. The webcam has come a long way over the last 20 years, since Connectix unveiled the black-and-white QuickCam in 1994, a model with a qVGA resolution (that's a quarter of VGA) that cost a hundred bucks at launch. Connectix's webcam business was acquired by Logitech in 1998. While models have improved markedly since then, there are instances where a built-in webcam, of the sort that comes with your laptop or smartphone, simply isn't good enough, especially for a small group of participants. Sometimes, you need something that is not only better qualitatively speaking, but also more flexible and versatile. Enter the ConferenceCam Connect by Logitech, an integrated videoconferencing solution that brings together speakers, HD camera and video output (plus a nifty little remote control). Wires are kept to a strict minimum with a totally wireless scenario entirely possible, using the on-board battery and any form of wireless communication (NFC, Bluetooth or Wi-Fi). 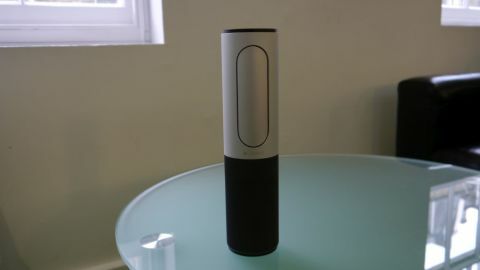 When the ConferenceCam was presented to the team at TechRadar, almost everyone was surprised by its shape. It looks like a gas canister of some sort, a cylindrical device that's just under 770g, and one that can be comfortably held in the hand. Removing the dockable, magnetising remote control that is attached to the upper part of the ConferenceCam reveals a full HD, tiltable camera with a Zeiss lens, 4X zoom, 90-degree field of view and a mechanical tilt wheel plus touch-capable volume buttons. The remote control itself is powered by a coin battery and allows you to control the volume, zoom in and out, pan, tilt and make/end calls. Two omni-directional full duplex microphones are located in the front and at the back with acoustic echo and noise-cancellation technologies. The lower part of the device is covered with a fabric that hides speakers which deliver 360-degree sound in a six-feet radius. The base contains a circular LED that turns blue when the device is on and when you are in a call, and red when the mic is muted. The top of the device has four touch-sensitive icons – a wireless screen mirror mode, the on/off button, a Bluetooth mode and a videoconferencing mode. At the back, you will find the NFC logo, a Kensington lock slot, a microUSB port, a full HDMI connector and a power socket. Accessories include a power supply unit and a separate USB cable. The ConferenceCam Connect performed admirably in normal office circumstances (i.e. with normal daylight or fluorescent light tubes). The fact that the unit contains the necessary hardware to encode video using H.264 UVC 1.5 with scalable video coding certainly helps. The audio sounded a bit muffled at times but should be more than adequate in most scenarios. As expected, it is compatible with Microsoft Skype for Business, Cisco Jabber and WebEx, and most other business-grade unified communication platforms, we suspect (Google Hangouts, GoToMeeting etc). Connecting it to a Windows 10 PC proved to be a breeze via a USB port. We couldn't however get our white-label smartphone to connect to the videoconferencing solution; the ConferenceCam Connect will, in theory, allow you to wirelessly mirror your tablet or smartphone to an HDMI-equipped monitor using Miracast. Unfortunately, Apple devices are a no-no for now given that they use proprietary AirPlay technology, but you will be able to connect it to a Mac computer. Chromebooks should also work but we haven't tested that. Expect the ConferenceCam to last up to three hours in webcam or mirroring mode and up to 15 hours when using it as an audio device, sans video. This webcam is not only solidly built but also easy to use. You will need to consult the 12-page manual though, at least initially to understand the meaning of the icons. At just under £340 at the BT Shop, the ConferenceCam Connect doesn't come cheap but it does fill a nice little niche that has been crying out for a solution that is elegant, sturdy, and offers both good audio and video performance. Overall, it is a great device that suffers from only a few nagging issues. For starters, a 90-degree field of view is poor compared to what some smartphones offer. The Samsung Galaxy S6, for example, has a 120-degree FoV allowing for a large portion of any scene to be displayed. The base could also be wider – because one expects the ConferenceCam Connect to be tethered most of the time, it is likely that wobbly tables combined with clumsy participants mean that the device, which has a rather high centre of gravity, is likely to topple over more frequently than others. A pyramid shape, similar to Logitech's venerable QuickCam Express, would have probably been a better choice, albeit one which isn't as futuristic-looking as a cylindrical tube.